Full color 10" x 13" ad asks the reader to "Compare Pall Mall with your old cigarette". The drawing shows a pilot sitting in his fighter plane looking at another soldier holding up two cigarettes so the difference in lengths is obvious. This ad is larger than my scanner bed so the outer edges of the ad may not be visible in the scanned view. Full color 9 1/2" x 12" ad drawn by John Falter. The drawing shows a sailor in dress uniform sitting with a young lady at one of a group of tables on a veranda overlooking a harbor with several battleships. He is holding up two cigarettes to compare their lengths to demonstrate the meaning of the ad headline "Something is happening in the cigarette business". This ad is larger than my scanner bed so the outer edges of the ad are not visible in the scanned view. Full color 9 1/2" x 13" ad for their Famous Cigarettes. The ad has a drawing done by John Falter of one Army officer talking to another officer who is lying on the wing of a fighter plane doing repairs. 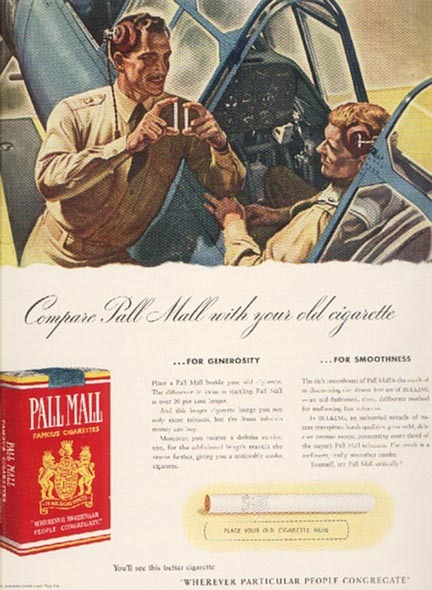 The first officer is holding up two cigarettes for comparison and saying "Right, partner - modern design means a cooler, smoke - a milder cigarette - Pall Mall". This ad is larger than my scanner bed so the outer edges of the ad will not be visible in the scanned view. Three color 9 1/2" x 13 1/2" ad with a drawing of a smiling man bringing a lit cigarette toward his lips. The ad headline assures you that by smoking this brand of cigarettes you can "Guard Against Throat-Scratch" and "enjoy smooth smoking". This ad is larger than my scanner bed so the outer edges of the ad will not be visible in the scanned view. Three color 9 1/2" x 13 1/2" ad with a drawing of Santa Claus smoking a cigarette. The ad headline says "Guard against Throat-Scratch - enjoy smooth smoking". This ad is larger than my scanner bed so the outer edges of the ad will not be visible in the scanned view. Three color 10" x 14" ad has a picture of a smiling lady in pearls and an evening dress smoking a Pall Mall. The ad headline encourages you to "Guard Against Throat-Scratch. enjoy the smooth smoking of fine tobaccos". 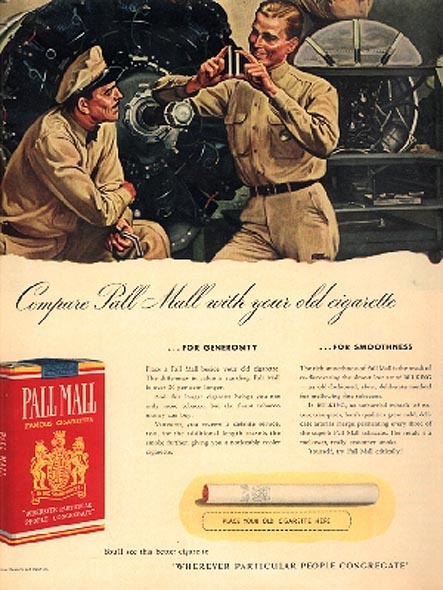 The ad includes a Puff Chart which tries to explain why "you're always ahead with Pall Mall". This ad is larger than my scanner bed so the outer edges of the ad may not be visible in the scanned view. Three color 9 1/2" x 13 1/2" ad with a large drawing of Santa Claus enjoying a Pall Mall cigarette. The ad has him saying "...smoke Pall Mall the cigarette whose mildness you can measure". The ad also contains a Puff Chart that is supposed to convince the reader that, by design, this cigarette will "Guard against Throat-Scratch". This ad is larger than my scanner bed so the outer edges of the ad will not be visible in the scanned view. Three color 9 3/4" x 13 1/2" ad that has a drawing of a man at a horse race track holding his pack of Pall Mall out for examination. The ad headline says that "Here's Mildness You Can Measure" and gives a three step way to test and show how you can "Guard Against Throat-Scratch." This ad is larger than my scanner bed so the outer edges of the ad will not be visible in the scanned view. Three color 9 1/2" x 13 1/2" ad with a drawing of a man sitting in the stands of a baseball game who is holding his pack of Pall Mall cigarettes up to be seen. The ad headline tells you to "Let your throat enjoy smooth smoking". This ad is larger than my scanner bed so the outer edges of the ad will not be visible in the scanned view. Three color 7 3/4" x 10 1/2" ad for their mild Famous Cigarettes. There is a drawing of a man in the stands of a football stadium who has turned around and is offering a cigarette from his pack of Pall Malls to someone behind him. Within a football floating over his head are the words "Let your throat enjoy Smooth Smoking. There is no substitute for Pall Mall - the finest quality money can buy". 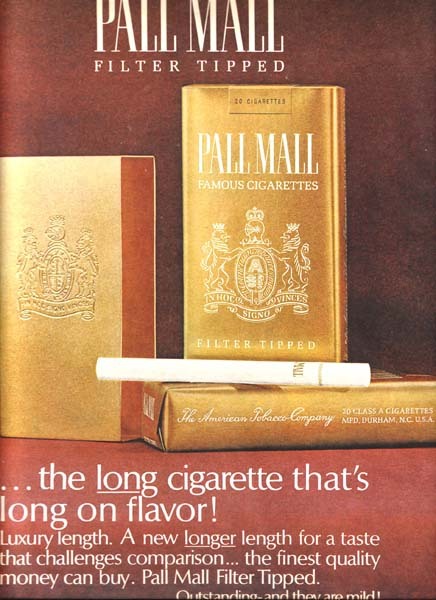 The ad text explains that the taste is better because "Pall Mall is Longer" and "Pall Mall is Finer". Three color 7 1/2" x 10 3/4" ad for their Famous Cigarettes. The ad has a picture of a man resting after some kind of a difficult day. He has undone his tie and is sitting with his feet on a desk with a cup full of writing implements and is enjoying a Pall Mall cigarette. The ad headline asks you to "Reward Yourself with the pleasure of smooth smoking. Smoke longer and finer and milder Pall Mall". The ad explains that the "extra length is only half the story" and mentions the richly, flavored tobaccos too. Full color 9 1/4" x 12" ad has a drawing of a pack of Pall Mall cigarettes sitting on a table with two lit cigarettes sitting on top of the pack. Next to the pack is a piece of sliced fruit on a plate. The ad headline claims you can "Get satisfying flavor...So friendly to your taste!" and the ad makes the claim that "You can light either end". This ad is larger than my scanner bed so the outer edges of the ad will not be visible in the scanned view. Full color 9 3/4" x 13" ad has a drawing of a pack of Pall Mall cigarettes against a yellow background and lying next to some scattered raspberries. The ad headline says "Get satisfying flavor...so friendly to your taste!". This ad is larger than my scanner bed so the outer edges of the ad will not be visible in the scanned view. Full color 9 1/2" x 12 1/2" ad for their Famous Cigarettes. The ad has a picture of an opened pack of Pall Mall cigarettes sitting next to a peach that has been sliced in half. The ad headline next to the fruit says "Taste Pall Mall...so Good! Good! Good!". The ad talks about how the taste is better because of the famous length of fine, good-tasting tobacco. I have always wondered if you were supposed to throw the cigarette away after taking two puffs because it wouldn't taste as good. This ad is larger than my scanner bed so the outer edges of the ad will not be visible in the scanned view. Full color 9 1/2" x 12 1/2" ad for their Famous Cigarettes with the extra length. The ad has a picture of a pack of these cigarettes in front of some oranges on a tree. The ad headline assures us that "Pall Mall's natural mildness is so good to your taste!" and has a comparison picture that shows this unfiltered cigarette is as long as other cigarettes with a filter. This ad is larger than my scanner bed so the outer edges of the ad will not be visible in the scanned view. Full color 9 1/2" x 12" ad has a drawing of a group of people in formal dress sitting in a dining room with the moon and the city skyline visible through the windows. There is a man in a white coat holding his cigarette up between two fingers showing the lady he is sitting with just how long his cigarette is. 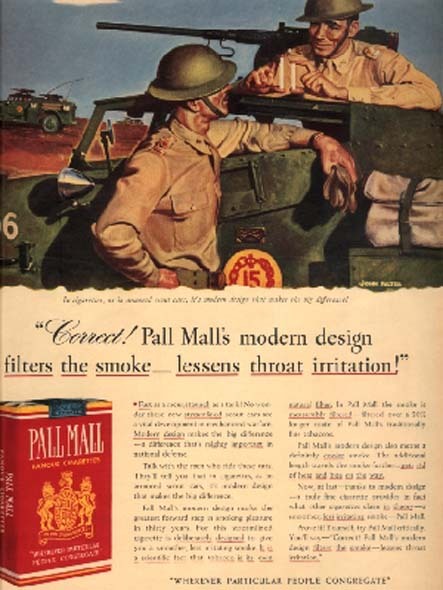 The ad headline claims that "Pall Mall's natural mildness is so good to your taste!" This ad is larger than my scanner bed so the outer edges of the ad will not be visible in the scanned view. Full color 9 1/2" x 12 1/2" ad for the cigarette that brags about the fact that "You can light either end!". The ad has a picture of a formal dining area and one man is holding his cigarette between his thumb and forefinger to show the lady he is sitting with just how long it really is. 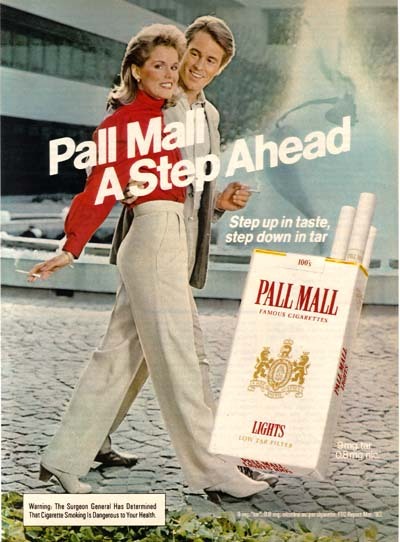 The ad headline claims that "Pall Mall's natural mildness is so good to your taste!" and the ad contains a chart to show that Pall Mall is an unfiltered cigarette that is as long as the filter cigarettes. This ad is larger than my scanner bed so the outer edges of the ad will not be visible in the scanned view. Full color 9 1/2" x 13" ad for their Famous Cigarettes. The ad has a drawing of an opened pack of these cigarettes sitting in front of a bunch of grapes, still on the vine. The ad headline assures you that "Pall Mall's natural mildness is so good to your taste!" and the ad has a comparison chart between the length of a Regular cigarette, a Filter-Tip cigarette and a Pall Mall. This ad is larger than my scanner bed so the outer edges of the ad will not be visible in the scanned view..
Full color 9 1/2" x 12" ad for the cigarettes with Natural Mildness. The ad has a picture of a man lying on his back in the grass. He holds a lit cigarette between his lips and is staring straight ahead as the smoke escapes from his lips. It looks like he had been reading a magazine which he has placed on his chest and put his hands behind his head. The ad claims that "You can light either end" and there is a little chart that compares the length of a Regular cigarette, a Filter-Tip Cigarette and a Pall Mall Cigarette. This ad is larger than my scanner bed so the outer edges of the ad will not be visible in the scanned view. Full color 9 1/2" x 12 1/2" ad for their cigarettes with natural mildness. The ad has a picture of a lady lying on her back in the green grass that is in need of being cut. She has turned her head a little to look at the camera and is letting a easy puff of smoke pass through her lips as a butterfly perches on her right shoulder. The ad describes the smoke you get from these cigarettes as being "so smooth, so satisfying, so downright smokeable!". This ad is larger than my scanner bed so the outer edges of the ad will not be visible in the scanned view. Full color 9 1/2" x 12 1/2" ad for their Mild Cigarettes. The ad has a picture of an attractive lady lying peacefully on her back in the grass. Her straw hat is pulled down over her eyes and she holds a lit cigarette between her fingers as smoke from her last puff gently leaves her lips. The ad headline tells us that "Pall Mall's natural mildness is so good to your taste!". This ad is larger than my scanner bed so the outer edges of the ad will not be visible in the scanned view. Full color 9 1/2" x 12 1/2" ad that highlights the Natural Mildness of this cigarette. There is a picture of an attractive lady lying on her back in a yard of uncut grass and smoking her Pall Mall cigarette. She has turned her head and is looking at the camera as she slowly exhales a mouthful of smoke. The ad calls it "So smooth, so satisfying, so downright smokeable!" and there is a comparison chart that allows the reader to see how much longer the Pall Malls are than the "regular" or "Filter Tip" cigarettes. Full color 9 1/2" x 13" ad for their Famous Cigarettes. The ad has a picture of a lady lying with her face to the unmown lawn holding a Pall Mall between her fingers as she looks skyward blowing smoke from between her lips. The ad headline tells us that "Pall Mall's natural mildness is so good to your taste!" and the ad has the normal chart that allows us to compare the length that the smoke will travel between the three cigarette types. This ad is larger than my scanner bed so the outer edges of the ad will not be visible in the scanned view. Full color 9 1/2" x 13" ad for their Famous Cigarettes that are long without having a filter. The ad has a picture of a lady in a pink and white sweater lying on her back on a lawn full of healthy grass. She is turning her head slightly to look at the camera while she lets some smoke escape from her parted lips as she holds the lit Pall Mall just above her face. 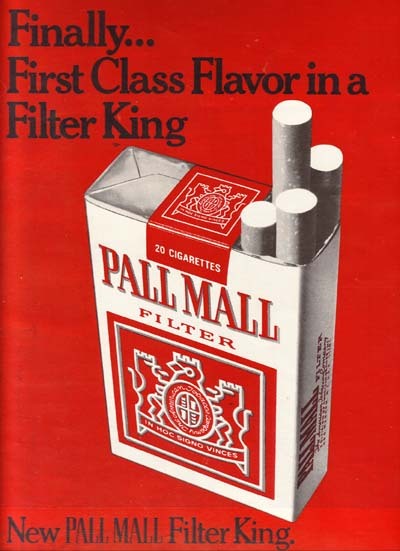 The ad headline claims that "Pall Mall's natural mildness is so good to your taste!". Full color 9 1/2" x 12 1/2" ad for their Famous Cigarettes. The ad has a picture of a lady lying on her side on the grass while she smokes a Pall Mall cigarette. As she lies there with her lips slightly open a gentle stream of smoke wafts upwards. 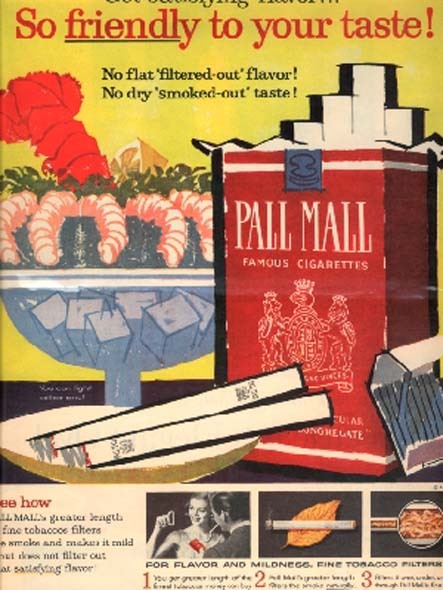 The ad headline claims that "Pall Mall's natural mildness is so good to your taste!". This ad is larger than my scanner bed so the outer edges of the ad will not be visible in the scanned view. Full color 9 1/2" x 12 1/2" ad has a photo of a pretty brunette lying on the grass enjoying a Pall Mall all by herself. The ad headline reminds us that "Pall Mall's natural mildness is so good to your taste!" and that it is "So smooth, so satisfying, so downright smokeable." A chart on the page compares the overall length of Pall Mall with a Regular and a Filter Tip and the practical length of tobacco..
Three color 9 1/2" x 13" ad for their Famous Cigarettes. There is a black and white drawing of a man in a cardigan sweater relaxing with a lit Pall Mall between his fingers and he is saying "Particular about taste? You bet I'm particular...and my Pall Malls prove it!". To emphasize the fact his black and white image is sporting a red I'm Particular" button. The text calls it "A long cigarette that's long on flavor. Outstanding!". This ad is larger than my scanner bed so the outer edges of the ad will not be visible in the scanned view. Three color 10" x 13 1/2" ad that shows a boxfull of "I'm Particular" buttons with the headline that makes it a "Friendly suggestion". The ad information says that "If you're particular about taste, you don't have to wear a button to prove it. Simply have a Pall Mall - a long cigarette that's long on flavor. Flavor that's blended in - over, under, around and through the finest tobaccos money can buy". The ad ends with the popular saying that they have, "Outstanding - and they are mild". Three color 7 1/2" x 10 1/2" ad has a drawing of a man wearing a cardigan sweater with a button saying I'm Particular pinned on it. The ad headline has him saying "Particular about taste? 'You bet I'm particular...and my Pall Malls prove it". It is refered to as "A long cigarette that's long on flavor. Outstanding!" Three color 9 1/2" x 12" ad has a drawing of a pack of Pall Mall sitting behind a button that has the familiar phrase, I'm Particular. The ad headline reminds us that "Millions are." The text then reasons that, "If you, too, are particular about taste, you don't have to wear a button to prove it! Simply smoke Pall Mall. Why? Because Pall Mall's natural mildness means just one thing: smooth, pleasing flavor. Flavor that's blended in - over, under, around and through the finest tobaccos money can buy!". Three color 9 1/2" x 12" ad has a drawing of a Button with the words "I'm Particular" on it. Below that is the question for the readers "How about you?". The ad then says that "If you, too, are particular about taste, you don't have to wear a button to prove it! Simply smoke Pall Mall. Why? Because Pall Mall's natural mildness means just one thing: smooth, pleasing flavor. Flavor that's blended in - over, under around and through the finest tobacco money can buy. Smoke a long cigarette that's long on flavor". Three color 10" x 13 1/2" ad with a few different words for Pall Mall cigarettes. It has a large picture at the top that shows the familiar "I'm Particular" buttons and it says underneath "Friendly suggestion". This has been used before but this time they have changed some of the words underneath. It says, the same as before, "If you, too, are particular about taste, you don't have to wear a button to prove it! Simply smoke Pall Mall. Why?". This part has been the same, the rest is where it is different. "Because Pall Mall's natural mildness means just one thing: smooth, pleasing flavor. Flavor that's blended in - over, under, around and through the finest tobaccos money can buy! Smoke a long cigarette that's long on flavor. Buy Pall Mall Famous Cigarettes. Outstanding - and they are mild". Three color 9 1/2" x 13" ad has a drawing of a large red button with the two words I'm Particular. The ad headline under this button simply says "Naturally." This ad is larger than my scanner bed so the outer edges of the ad will not be visible in the scanned view. Three color 9 1/2" x 13 1/2" ad for their Famous Cigarettes. The ad has a vast expanse of white with a button in the middle with the words "I'm Particular" placed in it. In the bottom right hand corner of the ad is an opened pack of this cigarette with another button asking you to "Be Particular". The ad headline asks you to "Declare yourself" and it says that you don't have to wear a button like one of these, all you have to do is smoke a Pall Mall. This will give you smooth, pleasing flavor from a long cigarette that's long on flavor. As the ad says, "Outstanding - and they are mild!". Three color 9 1/2" x 13" ad for their Famous Cigarettes. There is a drawing of the United States of America, 48 states only, with all areas covered with the red and white "I'm Particular" buttons. The headline explains that "You see them everywhere" and the text reasons that wearing a button doesn't make as much sense as actually smoking this cigarette. This ad is larger than my scanner bed so the outer edges of the ad will not be visible in the scanned view. Full color 9 1/2" x 12" ad has a picture of a man, looking like a James Bond character, who is reaching into the shoulder holster that is hidden beneath his tuxedo jacket. What he pulls out turns out to be not an exotic revolver or a unique weapon but a pack of Pall Mall cigarettes. The ad headline assures us that "Pall Mall packs Particular Taste". This ad is larger than my scanner bed so the outer edges of the ad will not be visible in the scanned view. Three color 9 1/2" x 13" ad for their Famous Cigarettes. The ad has a larger-than-life drawing of a pack of Pall Mall cigarettes with a peaceful scene behind it of a couple fishing from the shore of a lake and waving to sailboats that are putting out for the day. The ad headline calls these cigarettes "Outstanding - and they are mild!". This ad is larger than my scanner bed so the outer edges of the ad will not be visible in the scanned view. Full color 10" x 13" ad that shows a close-up of packs of "the long cigarette that's long on flavor!". There is an unlit cigarette lying on it's side and, yeah, it does look pretty long. Thdy claim that it has a "Luxury length" which is "A new longer length for a taste that challenges comparison...the finest quality money can buy". The claim is that "Pall Mall Filter Tipped. Outstanding - and they are mild". Full color 9 1/2" x 13" ad for their Menthol cigarettes. There is a picture of a pack of these cigarettes sitting in the middle of a forest of green, green leaves and green moss. The headline urges you to "Come to the forest-fresh taste of Pall Mall Menthol" and calls their product a "taller, cooler tasting cigarette." Full color 10" x 13 1/2" ad for the Pall Mall Filter Tipped cigarettes. Shown in this ad is a picture of an opened pack of these cigarettes that has been slid out of the carrying case that is also labeled Pall Mall Filter Tipped. The ad has them headlined "New Luxury Length" and then says that "You get that same famous length of the same identical Pall Mall tobaccos - and a filter tip. Discover the long cigarette that's long on flavor. Filter Tipped Pall Mall. Outstanding...and they are mild!". There is a little box at the bottom of the ad that mentions that there is a "Luxury length for menthol smokers" too. Full color 9 1/2" x 13 1/2" ad that comes up with another way to consider smoking Pall Mall Menthol. The ad is somewhat hazy, dark and green, and it seems to consider itself covered with trees. The headline says "Come to the forest-fresh taste of Pall Mall Menthol" which answers the question about what is with the green blobs. The text talks about "A taller, cooler tasting cigarette. 100 millimeters tall. With a longer length of cool tasting tobaccos. Pall Mall quality...with menthol. Popular filter price". Full color 9 1/2" x 12 1/2" ad for Pall Mall Gold 100's. The ad has a photo of a pack of these cigarettes on the back of a turtle that is supposed to be crawling toward the camera. The ad headline assures you that "With the 7 Minute Cigarette you always finish last." This ad is larger than my scanner bed so the outer edges of the ad will not be visible in the scanned view. Full color 10" x 13" ad for the Big Tip Pall Mall Gold cigarette. This ad has a photo of a man sitting in a restored '30's automobile while there are two identical-looking girls, one perched on the hood of this car and the other sitting in the rear seat. They both are identically dressed too. The headline at the top of the ad says that with this cigarette "You make out better at both ends". There is a sample of the two types of their cigarettes shown and, at the end that you light, it says "You get more at the flavor end" and at the filter end it says that "You get more at the mildness end". Three color 9 1/4" x 12" ad for Pall Mall Gold 100 cigarettes. The ad has a picture of an attractive lady with a short skirt reclining on the ground while she holds, in her arms, a very large pack of these cigarettes. 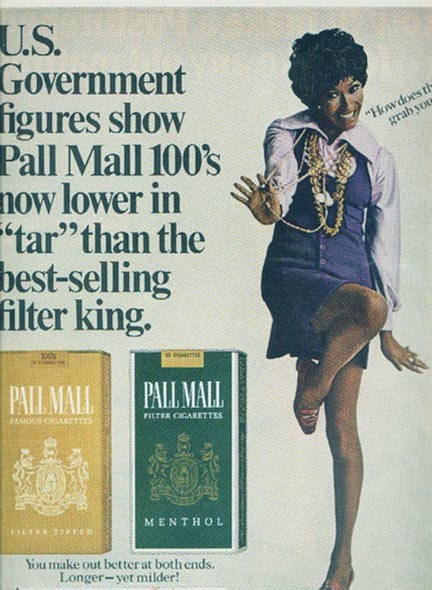 The ad headline makes the claim that "Pall Mall Gold 100's now lower in 'tar' than the best-selling filter king!". This ad is larger than my scanner bed so the outer edges of the ad will not be visible in the scanned view. Full color 9 1/2" x 13" ad for their Famous Cigarettes. This ad, like another one on this page only in color, shows a woman reclining on the ground with her legs stretched out to the side, holding an oversized pack of Pall Mall. The headline makes the statement that "Pall Mall Gold 100's now lower in 'tar' than the best-selling filter king!". It then asks "Who said so?" and replies to its own question by saying that these are "The latest U.S. Dovernment figures." A sample at the bottom of the ad explains their claim of being better at both ends by saying that the end with the tobacco is tastier and the end with the filter is Milder. Full color 10" x 12 1/2" ad shows a lady smiling and high-stepping as she asks "How does that grab you". This ad is larger than my scanner bed so the outer edges of the ad may not be visible in the scanned view. Three color 9 1/2" x 12 1/2" ad that shows a large pack of opened Pall Mall cigarettes against a red background. The ad headline says "Finally...First Class Flavor in a Filter King". This ad is larger than my scanner bed so the outer edges of the ad may not be visible in the scanned view. Full color 7" x 10 1/4" ad for their Gold 100 cigarettes. The ad has a photo of a man who is holding a lit cigarette up to his mouth. The ad headline explains "Pall Mall Gold 100's. Yes, longer yet milder". Full color 7 3/4" x 10 3/4" ad for their Light 100's. These cigarettes are "Longer, yet lighter" and there is a picture of two pair of hands, each holding a cigarette between the index finger and thumb to issustrate the difference. The longer cigarette can be seen to be a Pall Mall and the shorter cigarette has the word WInston printed on it. 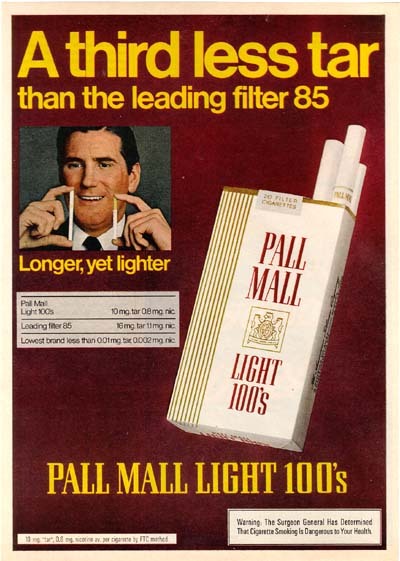 They claim to have "A third less tar than the leading filter 85" and they end up being "Longer, yet lighter"
Full color 7 1/4" x 10 1/2" ad has a photo of a man holding up one cigarette in his left hand and the longer Pall Mall in his right. The ad headlines claim that they are "Longer, yet lighter" and that they have "A third less tar than the leading filter 85". Full color 7 3/4" x 10 3/4" ad that shows a smartly dressed couple strolling past a fountain. The ad headline says "Pall Mall. A Step Ahead".